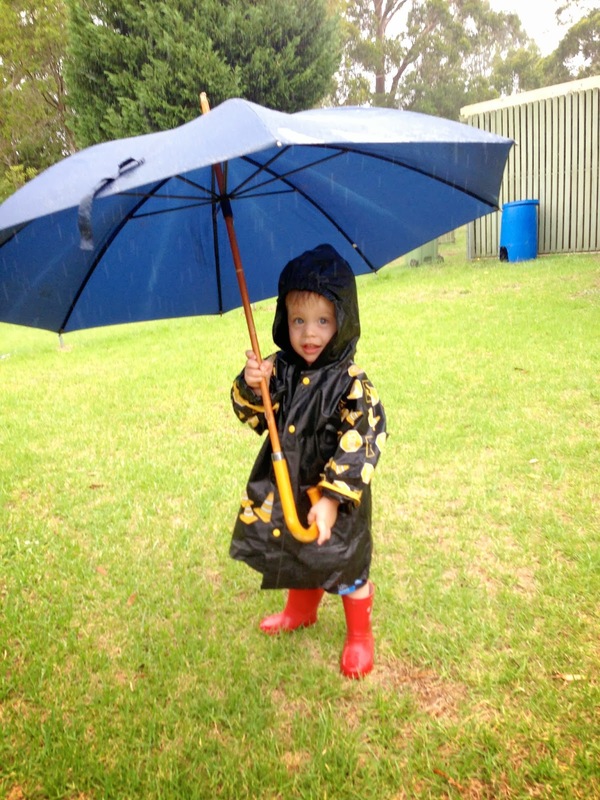 My friend Juanita, from Wife Mumma Life, has been running an Activity and Photo Challenge in March. I have done simple activities with the children, but it’s been nice looking for specific opportunities to participate in play, kind of gets us out of our comfort zone in a non stressful way. You can play too if you want, or feel free to follow our play on Instagram. Before finally all five contributed! Day 2 – Um. We had a really busy Sunday with church, a party and then tired kids sleeping while big kids went to look at motorbikes with Daddy. No time to play with string! This was delightful. I just loved the way the play progressed on this day. I hadn’t decided what to do according to the prompt, “Water”. But the kids wanted to play outside, I said they could then opened the door for them while talking on the phone and realised it was raining. I shut the door, but it was too late. Their hearts were set on the outdoors. We put raincoats on (so cute!) and headed out. I figured at that point that technically I could claim this as water play. But once we got to the sand pit, I saw a watering can. Perfect. I filled it up and gave it to Immy. She adored tipping the water into the sand. Then one of the boys asked her to tip the water into the back of his truck. Which she happily did. The other boy that this was a great idea and before long there was a queue! After finding a second watering can, they became happy filling the cans up over at the tap, and then traipsing over to the sandpit to empty it. I don’t know why the sandpit needed to be the empty spot! I was a watering can short, so Jayden got a glass. He was hilarious carrying it over to the sandpit. I hadn’t prompted him, but he carried it oh so carefully so not a drop would spill. He had such a funny walk while he did it! Meanwhile Toby got bored (Typical of Toby) and started walking with the umbrella. Their last play with water turned scientific as they watched carefully as they poured it down the slippery slide. I had my doubts about what we could do this day. I had people coming around in the evening and a lot of cleaning up to do. Cooking with triplets is very time consuming and messy. It turned out, they loved their time in the kitchen, and I didn’t need to do a thing! We’ve had a dodgy oven that has been both burning things and leaving things raw. Not ideal. The electrician turned up to fix it (Huzzah!) and the triplets were rivtetted by the man fixing oven show. I didn’t ask the fellow what he felt about being in-home triplet entertainment, but he had confessed that he himself was a triplet so I felt that it was only fair that since he made it to adulthood that he give back to the Higher Order Multiple community. (Us Triplet Mummys call ourselves HOMmies.) And so I allowed the triplets to sit watching him while they sucked on their lolipops. Day 5 – Chalk. Another missed day. It’s a lot harder to do this when you have been out during the day – and don’t have any chalk and no time to visit the shops. Serious lack of planning! ing flowers on the way. The triplets normally are confined to a small fenced area, for obvious reasons. So when they get out in the larger garden, they love it. Although you have to be very careful. It really is easy to lose them in our very large block. But altogether, it was a lovely little walk with them. I’m glad we did it too, I discovered that a little pineapple had ripened in our very over grown weed garden vegie patch. Mind you, a possum had got to it first, but when we got back in the house, the rest of us enjoyed it. Incredibly sweet and very yummy! There’s plenty of days left. Do you think you would like to join in the #wmlplayeachdaychallenge ? I’m loving that the prompts just make me think a little more, and even though I’m doing very easy things which fit easily into our days it’s getting out of our comfort zone and rejoicing in the importance play has during childhood. Most of these photos are just taken with my iPhone! I need to work on my photo taking abilities also! Especially taking my DSLR out of Auto when I use it! It’s hard to do it when there’s more children and pressure in the equation. I’m finding that these prompts are great. And as you can see I keep it simple, but it’s making me be more thoughtful and looking for play opportunities, so I think it’s safe to say we are all loving the challenge!